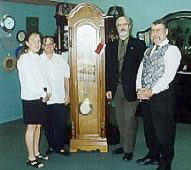 Roger and Christine Schofield had for some time had a dream about starting a retail clock shop in New Zealand. 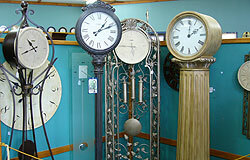 A shop that carried a wide range of clocks of all sizes and styles and really gave customers a choice from which to choose from. Rogers background in sales and marketing led him in a roundabout way to the job of running the world famous Claphams Clock Museum in Whangarei, where he developed a fascination for clocks of all styles and vintages. Researching the background and personal history of the 1600 items in the collection left him with a great respect for the clock makers of the last 300 years and a love for the quality and beauty of these timepieces, many of them treasured family heirlooms. Often the clocks were donated to the museum because the owner had nobody to leave the clock to. Sometimes they were donated because they had too many descendants and couldnt decide who should get the clock. The oldest clock in the museum was 270 years old and still faithfully keeping the time and striking the hour. It occurred to Roger that a well-made clock, faithfully maintained over the years, will perform its duty almost indefinitely. The beloved clock can then be passed on from generation to generation and becomes a living link with the past whilst still being a thoroughly useful possession. Imagine owning a clock that had been in your family since 1730 and was still going. 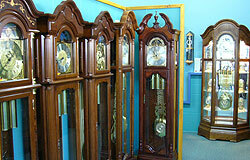 Unfortunately, usually owing to a lack of space, most shops retailing clocks only carry a very small number of items. There are some magnificent clocks available today that have never been seen in New Zealand. 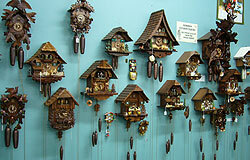 It is Roger and Christines intention to start stocking these clocks in their shop. The choice of Tirau to open their shop was not a hard one to make. Given the statistics of the travelling public in New Zealand, both national and international, meant that the shop needed to be located between Auckland, Rotorua and Taupo. Tirau fitted the bill perfectly and has already become a retailers dream thanks to the vision of Henry and Ann Clothier. 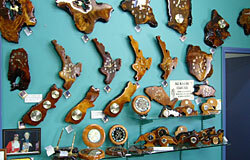 Next time you are travelling in the North Island stop at Tirau for a break and visit this unique clock shop. Youll find Tirau about half way between Tokoroa and Hamilton. You will not be disappointed and are bound to have a great time. who was visiting Tirau in April 2002. Roger and Gerd Hermle. 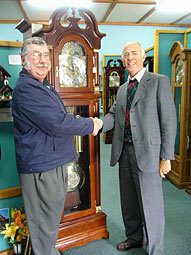 Gerd is the owner of Hermle Clocks of Germany and are the biggest manufacturer of clocks in the world. About two thirds of the clocks in our shop are made by Hermle. Miriam of Matamata "Love those cuckoos!" Nelis Family, Waikato "Really cool clocks"
Hannah, Auckland "Gorgeous German cuckoo clocks"
Emma, Putaruru "Very well presented shop, shop really cool"
Melissa, Auckland "Beautiful store and lovely people"
Logan, Albany "This place is so cool"
Janette, Brisbane "A joy to wander through - many thanks"
John, Blockhouse Bay "Tick tock - this shop rocks"
Janice, Nelson "Fascinating - gobsmacked"
Tania, Waimate "Never seen so many clocks in my life"
Danielle, Hamilton "I love clocks NOW"
John, England "Never seen anything like it"
Tony, South Australia "Awesome collection, never seen better - will be back"
Mary, Dannevirke "Wonderful shop and somewhere to get what we wanted"
Sid & Jenny, Australia "Fabulous - need more time to look at everything"
Alan, Norfolk Island "Great and soothing"
Keith & Mary, United Kingdom "Congratulations, beautiful clocks, lovely people"
Mike, Rotorua "Peaceful and great display of clocks, fantastic"
Kevin, Queensland "Beautiful, love them"
Sylvia, Australia "Nice way to pass the time"
Amanda, Beachmere "Not enough hours in the day"
Tania, Spain "Lovely - takes me back to Europe"
Hazel, South Africa "If I had a big enough house I'd take the lot!" 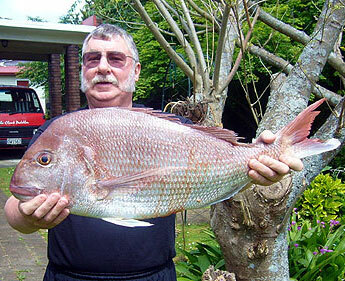 Barbara, Matamata "Absolutely wonderful selection"
Laurie & Lorraine, Waipukurau "Wunderbar"